With the new Autoconer X6, Schlafhorst is presenting a quantum leap in process automation to the global public at the ITM. The revolutionary Bobbin Cloud material flow system with intelligent data management ensures maximum flow rates and minimum personnel requirements. 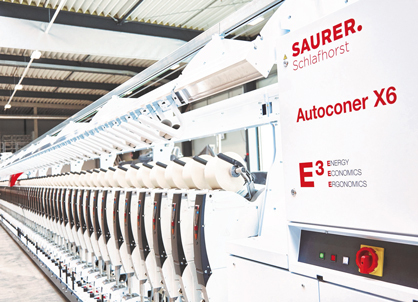 The Autoconer X6 opens up a new dimension of efficiency with smart technology: The new, E3-certified generation offers sensationally low resource consumption, palpable productivity advantages and even more ergonomic handling. With the Bobbin Cloud material flow system based on the latest RFID technology, the Auto- coner X6 guarantees maximum process reliability thanks to clever, software-controlled material man- agement. The Zinser 72XL is a highly productive ring and compact spinning machine for large spinning mills which intend to increase their rate of return by making production particularly economical. 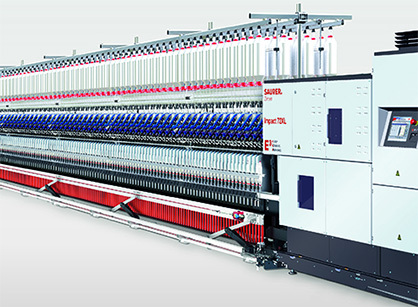 The Zinser 72XL clearly shows its advantages in almost all applications: in ring and compact yarns of any fine- ness as well as in fancy and special yarns. 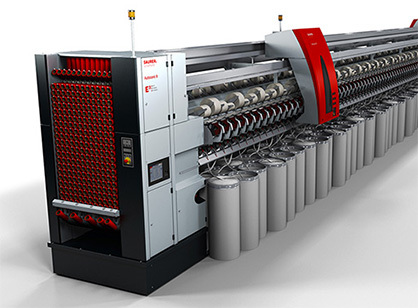 Equipped with up to 2,016 high-speed spindles, the Zinser 72XL reduces production costs by up to 11% and the required floor space by up to 22%. Saurer is also presenting components from Temco, Daytex and Fibervision. The brands are technolo- gy leaders in their respective sectors and offer high-quality solutions for the processing and monitoring of filament fibres and yarns. The Saurer service station in the middle of the pulsating textile district of Kahramanmaraş is compre- hensively equipped and offers customers there service on their doorstep: 60 trained members of staff are on hand to look after all of the Turkish customers' needs. Thanks to the expanded spare parts warehouse, they can now immediately supply the spinning mills with genuine spare parts if need be. On the Autocoro 8 rotor spinning machine installed there, our team of experts produces sample spin- nings directly on site. 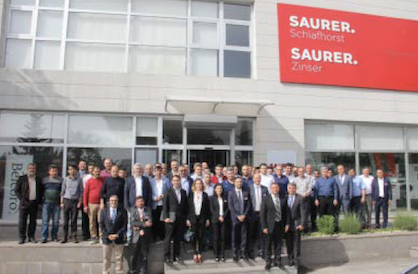 Saurer has further expanded its service network with the service station in Kahramanmaraş. 20 service stations now offer customers worldwide service with lightning-fast re- sponse times and unique features, such as the unprecedented Life Cycle Innovation Management Programme. The Saurer team outside the service station in Kahramanmaras. Saurer is excellently positioned in Turkey. Saurer looks forward to your visit at the ITM 2018 in hall 3, booths 311B and 303B.